You educate a woman and you educate the whole nation! This quote describes Neha Gandhi- the owner of Matsya perfectly. It’s only a woman who can rise like a phoenix from the ashes and create something so meaningful where everyone else only saw rubbles. One of the biggest reasons why I choose her - were her eyes. There was something very unique about her as I kept looking at her I saw a spark, a spark to conquer the world with that bright smile of hers. A spark to make a difference and a spark to do something for the underprivileged. I could see the passion she had in voice when she spoke about Matsya, the artisans and her other team members. Such passion is actually the fuel which pushes them towards their goal despite the challenges that come their way. I could feel the excitement when she described her new plans and projects for Matsya. Secondly having been born and brought up in Gujarat handicrafts is something we are have thrived upon. In our schools also embroidery was a subject we were taught along with craft and clay modelling. No wonder I have developed a soft corner for all these things. The list of reasons are many but what made me fall in love with her was the way she described Matsya. 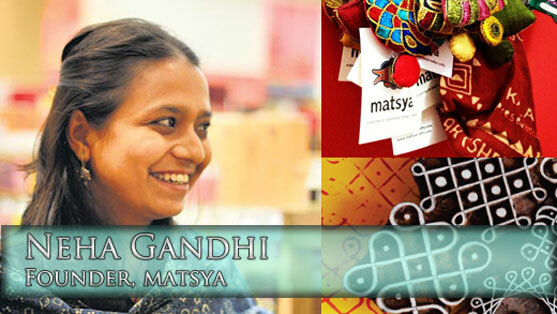 In her own words “ Matsya is a labour of love that began with a journey”. It is said that anything done with love never goes unrewarded. Perhaps that best explains the success of Matsya. I connect with her deeply for that passion, excitement and spark is something that people tell me I have when I talk about my dreams. Dreams on which I am working and I know that it this thing which makes them come true.Dreams in our eyes ensure we keep awake and continue working towards making them come true.And that is exactly what I saw in her eyes. There was no fatigue or sleepless nights or stress rather there was a sense of excitement of what is going to come next , rather there were dreams shining in them waiting to come true! The story of Matsya began where perhaps all stories end, the 2001 earthquakes in Gujarat. The moment I read her story I knew I had to share this tale of sheer grit and determination of doing something for the underprivileged. In year 2001 Gujarat faced what was perhaps the worst form of natural calamity. In the form of earthquake the huge snake of disaster had the entire state in its clutches. Anywhere you saw all that was visible was destruction and chaos. Buildings collapsed as mother earth shook in anger taking along with it thousands of lives. At such a time Neha had visited Bhuj (one of the worst hit locations) to do some social work with other volunteers. Amidst broken homes, shattered lives and dead bodies she saw a glimmer of hope when she saw the abundant art those people living in the rural area had. And so was born Matsya – from the debris to become a rock solid foundation for the rural art and handicrafts. Every time I read about her and see this video, the thing that astonishes me the most is the circumstances in which she came up with this idea. Any normal human being would be too intimidated with the happenings and the catastrophe around them. But Neha was different and she proved it by coming up with this brilliant idea where people did not see anything but death. I watched this video a couple of times and was left speechless. I could not sleep that night as it compelled me to do some self introspection. What are we giving back to the society? In our race to make more money have we ever paused and thought there must be some people who must be less privileged than our? And worst, have we ever thought of doing something for them? Neha compelled me to think about all this and also made me realize how shallow our existences have become. We have become so self centered that unless we are a part of the catastrophe we seldom want to do anything about. Humanity seems to have been long forgotten as helping fellow human beings does not even strike our minds leave alone doing something about it. I always believe - When you have fire inside you one which cannot be doused by anything, that is when you make the impossible possible. Neha experienced this fire when she was in Bhuj as she saw tremendous talent and possibilities lying before them while they themselves were unaware about it. Many times in life we face situations where we have two options - either surrender or fight with all our strength. Neha choose the later and fought with all her strength where finally she was victorious. She is truly an inspiration and has made me realize that each one of us can make a difference, provided we work hard to do that.She not only encourages those village artisans to keep using their creativity, she also has an expert team at hand which manages the marketing part by being constantly hands on about the happenings. “I aspire to inspire” is a quote Neha has lived by till now and does that every day as she pushes these rural artists to give their best and in turn she ensures they get their best by making their handicrafts reach various places all around the world. For me Neha Gandhi is truly an epitome of hope, sheer grit and determination. I truly admire the way she has brought up the entire idea of Matsya and made it what is it today for she inspires me to dare to dream, give my best and then wait for the Universe to unfold it's secrets for me. Just the way she came, she saw and she conquered- hearts and lives! Written for the Indiblogeshwaris' "Ladies Independence Special Contest" in association with "womenentrepreneursinindia.com"
It's truly a wonderful compliment to read this ! Nothing better than social entrepreneurship is there, Privy? A very inspiring woman for sure. Thanks for sharing. Good luck with the contest. Thanks.I am speechless now. I hope more and more people can experience & explore a bit of matsya.I admire your ability to write and express the dreams, aspirations of a social entrepreneur. Your heart and passion has just poured out in your writing.Good Luck! I am truly touched and honoured to read this from you. Women can stand shoulder to shoulder in everything or ahead in certain things. Nicely explained. Nice to know this person, Neha Gandhi, and about her work. In a world where everyone is becoming increasingly selfish and shallow (as you've said), it's wonderful to know that there are people like Ms Gandhi. Yes Tomicham, she truly is an inspiration!! Oh... sure will google and try doing that!